Stop The Itching, Start The Healing! 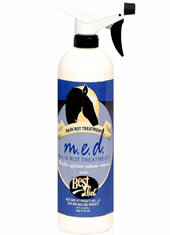 Best Shot's Equine Rain Rot Treatment is effective natural relief for bacterial and fungal skin problems including rain rot, scratches, girth itch, sweet itch, dry skin and tail/mane rubbing. Enjoy its pleasant botanical scent. Non-medicated, non-veterinary grooming preparation for hygiene purposes only. Regular use promotes new hair growth, enhances coat health and appearance. Ready to use. Proven antiseptic herbal treatment for the natural healing of skin conditions from Rain Rot and Ringworm to Dew Poisoning and Mud Fever. Use as an anti-fungal, antibacterial, antiviral, and anti-inflammatory remedy to restore healthy skin and coat with no steroids to affect testing in performance horses. The natural blend of eucalyptus oil, aloe vera, camphor oil, and wintergreen oil kills the organism responsible, repels biting insects that spread infection from horse to horse, and promotes healing. Accelerates recovery from wounds, soothes burns, and eases pain. Promotes cell regeneration to help hair growth and prevent scarring. Treatment for: Rain Rot or Rain Scald, Ringworm, Mud Fever, Cracked Heels, Scratches, Dew Poisoning, Greasy Heel, Mud Rash, allergies, poison ivy, etc.